The ride posting clearly stated my rain policy: "I am a weather wimp; the ride will be canceled if rain is forecast" and the forecasters seemed to oblige by calling for a 20% chance of the wet stuff falling before 10AM, the start time of the ride. 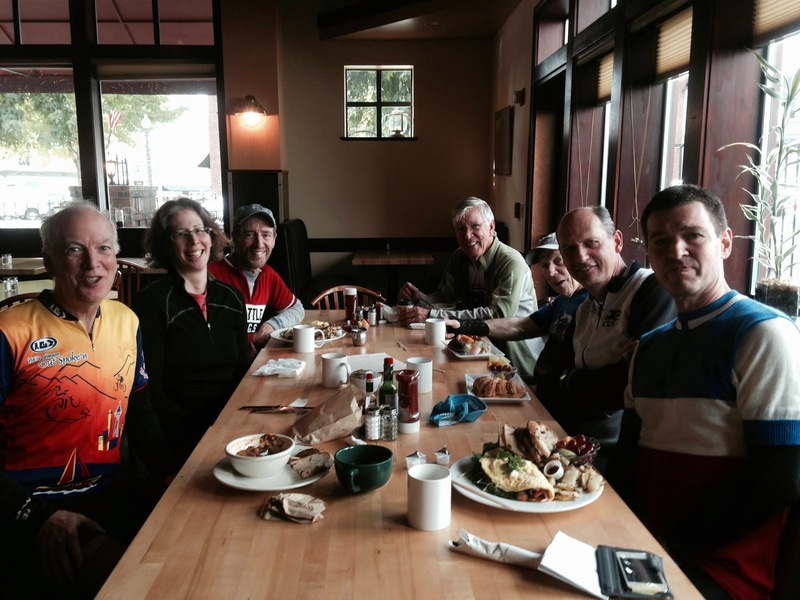 So, when the 11 of us set out heading north from Snohomish, it was on nearly dry pavement, with hopes of improvement. After exiting the Centennial Trail at Machias, there was some temperature-regulating misting from the sky which was very much appreciated. The worst thing is to get overheated in the first 10 miles of a 34-mile ride, so having our personal misters following us around worked out very well. But some time after we climbed up to the Snohomish Plateau and were on Storm Lake Road (we should have taken a different road, I guess), I was aware of wetness completely covering my face, dripping down my nose and chin and entering my shoes. The fine mist had turned coarse, with the trademark "Super-Soaker" wetness that the Northwest is known for. The moisture is enveloping from the top, sides and bottom and leaves no dry areas, though it barely looks like much at all is falling from the sky, a veritable "no-see-um" on the precipitation spectrum. But it was not rain. After careening down a steep hill with good run-out (crucial when your braking surfaces are slick), we crossed Hwy 2 into Monroe and crossed into the domain of pouring. I should note that being an optimist and declaring the ride was a go in the morning's email meant that I was not going to be carrying raingear, nor even wearing a wool jersey. The temperature was in the low 60s and I was wearing my new Ibex bra and arm warmers, so I thankfully stayed warm, but not without some concern and offers of extra layers from my fellow riders. Leaving Monroe, we all had one thing on our minds, to get back to Snohomish and our dry cars as quickly as possible and we took off at a good pace along the Old Snohomish–Monroe Rd, accompanied by many drivers who seemed to also be in a big hurry, whizzing by us as we were squeezed toward the edge of the road. At the top of the last roller toward town, the sun came out to erase all evidence of moisture from our bodies and bikes. Technically, it never rained on our ride anyway; it just misted, super-soakered and poured. And, after putting away our bikes in our cars and walking through town, I noted that what the riders would really remember was the very last bits – riding in sunshine and the fantastic lunch and conversation we shared at the cafe.